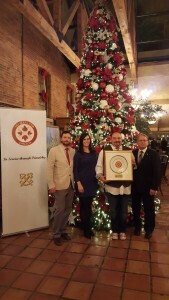 The Windows by Jamie Kennedy Fresh Grill & Wine Bar restaurant located inside the Sheraton on the Falls hotel has just been awarded the 2015 Golden Plate Award. Les Clefs d’Or Niagara recognizes one local restaurant each year with this prestigious award based on criteria related to cuisine, customer service, restaurant atmosphere, reservation convenience, and guest feedback. The award is now in its ninth year and the Windows by Jamie Kennedy Fresh Grill & Wine Bar team is honoured to be chosen as the 2015 recipient. Lead by a strong commitment to seasonal cuisine and Niagara’s burgeoning farm-to-table movement, each Windows dining experience offers a remarkable taste of the best ingredients that Niagara has to offer along with an extensive list of award-winning local wines. The Windows by Jamie Kennedy Fresh Grill & Wine Bar team is proud to be recognized for their commitment to excellence and looks forward to continuing to offer spectacular Fallsview dining experiences right in the heart of Niagara Falls.